QueueMaster is a render queue automation script designed to significantly reduce the time needed for setting up renders. It achieves this by associating label colors with any render settings you’ve defined. You can define templates, file paths, versioning, and more! It’s particularly handy for teams of After Effects users who want to ensure everyone is producing renders the same way. 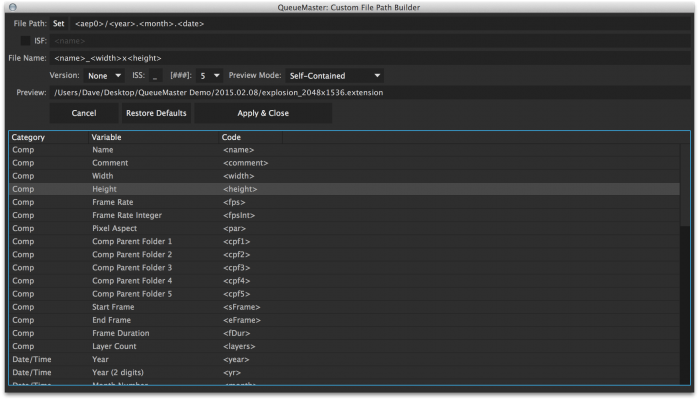 QueueMaster uses relative file paths, which makes it possible to move between projects without the need to define the output directory each time you render. QueueMaster looks where your After Effects project is saved and bases all output directories from that location. Automate up to 32 Output Modules per render queue item! Choose from over 50 variables such as date, time, comp resolution, and etc to aid creation of file paths / file names. The QueueMaster interface now displays the color for each Quick Label. The colors can be customized in the Full tab. It's now possible to add notes for each label. These notes can be viewed while mousing over the Quick Labels and holding the shift key. In addition to the current copy/paste features, you can now individually copy and paste output module settings. When using the "Prep Queue" command, you can hold the shift key to begin rendering immediately after the settings have been applied. New versioning method allows you to archive older renders without causing version numbers to reset. Added integration with RenderHogs. QueueMaster can enable all layers/effects tagged as hogs on before rendering. All substitutes will be disabled. Take a tour of the new features! Versioning can be used for both self-contained formats like Quicktime as well as image sequences. 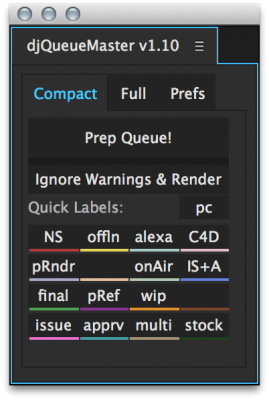 Do Not Render - When applied, QueueMaster will un-queue any comps with the associated label color to prevent rendering incomplete work. Render comps into a folders with the current time and/or date. Sort comps into folders based on their resolution, frame rate, format, numbers of layers, number of layers, duration and etc. 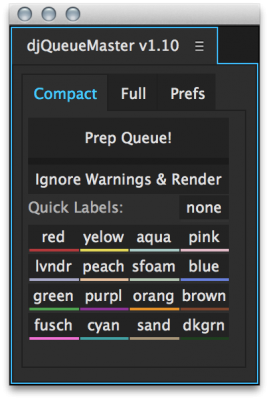 The Quick Labels interface lets you assign render presets to your comps without the need to remember the color associated with each preset. Simply highlight the comp(s) in your bin and click on the Quick Label to be applied. You can customize the text and color for each button. QueueMaster allows you to add notes to any labels. These notes can be viewed by holding the shift key when mousing over the Quick Labels. This makes it easy to recall any important information associated with the way your renders will be produced for a particular label. If you use the RenderHogs script, QueueMaster can automatically enable all hogs and disable all substitutes while prepping the queue. RenderHogs aims to make heavy comps more responsive by disabling any unecessary layers/effects until render time. QueueMaster generates a settings file that can be backed up, stored with your project files, emailed to other users, shared over a network, and etc. You could potentially create a different settings file for each client, or each type of project. Changing the settings file is a simple task that is done in the Prefs tab. Store the settings file on your network so multiple After Effects users can ensure they're producing renders in a consistent way. QueueMaster has a Read Only mode that prevents unintentional modification of the settings file. Use QueueMaster to define render presets for every phase of your project such as picture references, work-in-progress, client approval renders, final renders and etc. Each phase can be saved to a different directory in an effort to keep your files organized. QueueMaster can help with color managed projects. Working with Alexa Log-C footage is one of the best examples of this. QueueMaster can be configured to output both Log-C and sRGB files for a single render, meaning you have your final file with the LUT applied as well as a second file that can be used for viewing reference. See this video for more! QueueMaster is great for teams of After Effects users who want to ensure everyone is producing renders the same way. Keep renders organized by time, date, resolution, and etc. Please try QueueMaster with a sample project before attempting to use it for your work. Once you’ve setup all your presets, use the Compact tab to reduce the footprint of QueueMaster in your interface. When you mouse over most buttons/controls, a help tip will appear giving you detailed information about that command. The help tips can be disabled in the Prefs tab once you've become familiar with QueueMaster and no longer want to see these popups. Don’t forget to customize your Quick Label buttons! 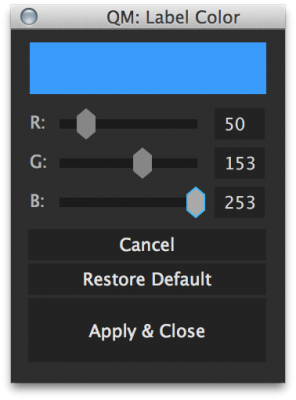 These buttons allow you to quickly apply output settings to your comps without the need to remember the color associated with each preset. If you share your QueueMaster settings file with other users, make sure they have the same render templates and output module templates as you. It’s possible to export/import these by going to the Edit > Templates menu in After Effects. It’s best to install QueueMaster to the Script UI folder so it can be docked into the After Effects interface. Once the script is installed, launch it from the Window menu. Make sure “Allow Scripts to Write Files and Access Network” is enabled in the General section of the After Effects preferences. It’s always a good idea to backup your settings file once you’re finished with setting up QueueMaster. Color labels must be applied in the bin using either the QueueMaster Quick Label buttons or by right clicking on the comp(s). 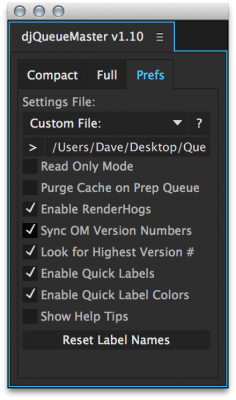 Changing the color labels inside the render queue will have no effect which output settings are assigned. Before purchasing QueueMaster, please download the trial to ensure it suits your needs. When using the "Ignore Warnings & Render" command, the render will fail if the comp contains missing footage. Occasionally the Quick Label colors dissapear inbetween loading projects. In After Effects CC, double clicking on the variables list doesn't add the selection to the file path / name as expected. You can simply type the variable instead. Please don't hesitate to open a support ticket if you'd like to submit feedback, ask questions, or request additional features for QueueMaster. - Up to 32 Output Modules are now supported! 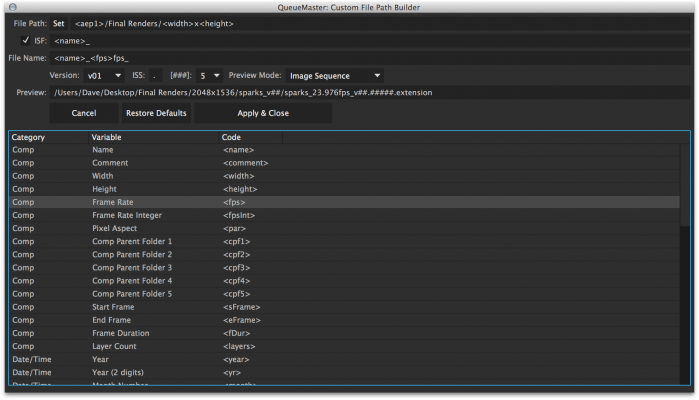 - QueueMaster now offers file path creation using variables. Choose from over 50 variables such as date, time, comp resolution, and etc to aid creation of file paths / file names. - The QueueMaster interface now displays the color for each Quick Label. The colors can be customized in the Full tab. - Added additional functionallity to Prep Queue and Ignore Warnings & Render buttons through the use of modifier keys. See help tips when mousing over for more info. - Added integration with RenderHogs. QueueMaster can enable all layers/effects tagged as hogs on before rendering. All substitutes will be disabled. Disable unnecessary layers and effects until render time. Includes tools for maintaining responsiveness in heavy comps.